Family Feud meets Google. Guess the autocomplete query. 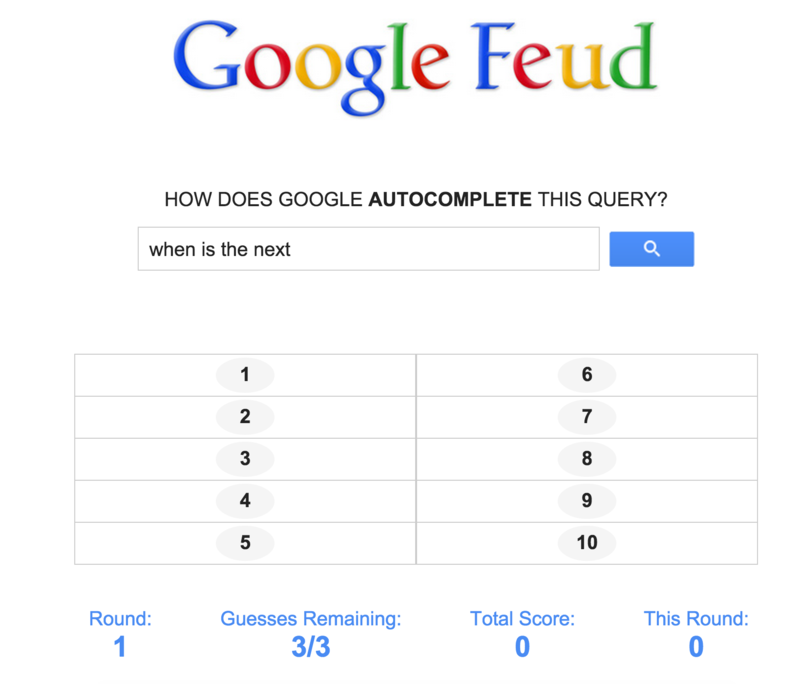 Would you recommend Google Feud to a friend? This is fun and very difficult. People search Google for the strangest things. h/t @alyssabereznak for tipping me off to this one. @rrhoover I just spent 20 mins playing, it's great. Are there other apps you've seen in the category of "data as games"? @matthartman That would be a good collection. This is reasonably amazing. I wish it were a little more forgiving around answers that are essentially the same but worded slightly differently. @bhalp1 Yeah, I agree. For the one we just did, two of the answers where "is an example of a/an" and "is an example of a an"... what? Dare someone to get meta on this and create GoogleFuedFued - You have to guess what people answered on GoogleFued to each question - I got frustrated and entered some odd answers! Also, agree on the level of forgiveness, some flexibility would increase the fun for sure. @rossdcurrie I could use a multi-player option too. Or, since I'll prob play in person, a simple timer could help keep the game moving. Such a fun game.